Bradley was sick on New Year's Eve, so instead of my parents babysitting so that Chris and I could go to dinner with friends like we originally planned, Chris and I decided to spend the night at home with our baby. After putting Bradley to bed at 8:00, we went down to the kitchen and cooked ourselves a feast that included ribeye steaks, sautéed mushrooms, macaroni and cheese and roasted brussels sprouts. I also whipped up some strawberry bellinis and this chocolate cake, since you can't ring in the New Year without something sweet :) It was a perfect evening. 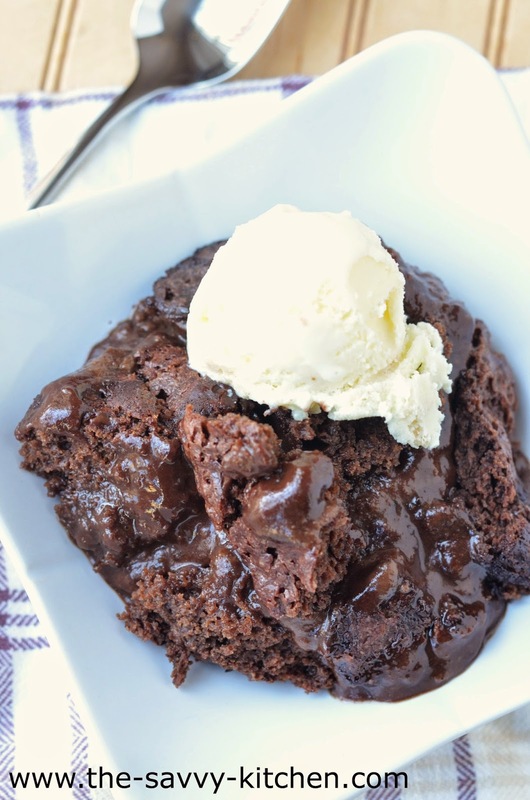 Hot Fudge Pudding Cake reminds me of Molten Lava Cakes. Have you seen those? They're individual mini cakes that look like a fully cooked solid cake, but then you stick your spoon in the middle and a gush of gooey warm chocolate oozes out. It's pure decadence. This cake was almost the same thing, but served in one big dish instead of individual portions. 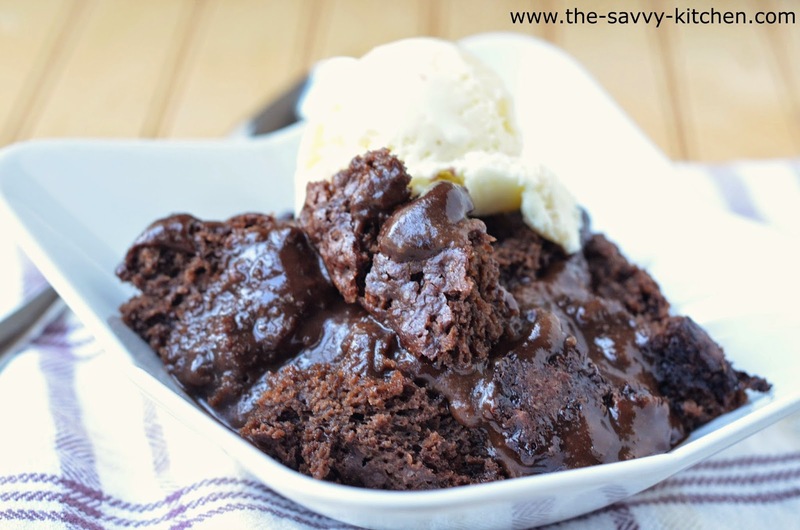 The warm, fudgy pudding part is my favorite since it makes the cake extra moist and rich. Everyone will love this cake. Enjoy! Preheat oven to 350 degrees F. Heat a pot of water on the stove to very hot (just under a simmer) or microwave water for 2 minutes. In the bowl of a stand mixer, combine 3/4 cup of the granulated sugar, flour, 1/4 cup of the cocoa, baking powder and salt. Stir in milk, melted butter and vanilla and mix until smooth. Pour the batter into an lightly greased 2-quart ceramic dish or a 9-inch square baking pan (if it's a non-stick pan, you don't have to grease it) and spread evenly. 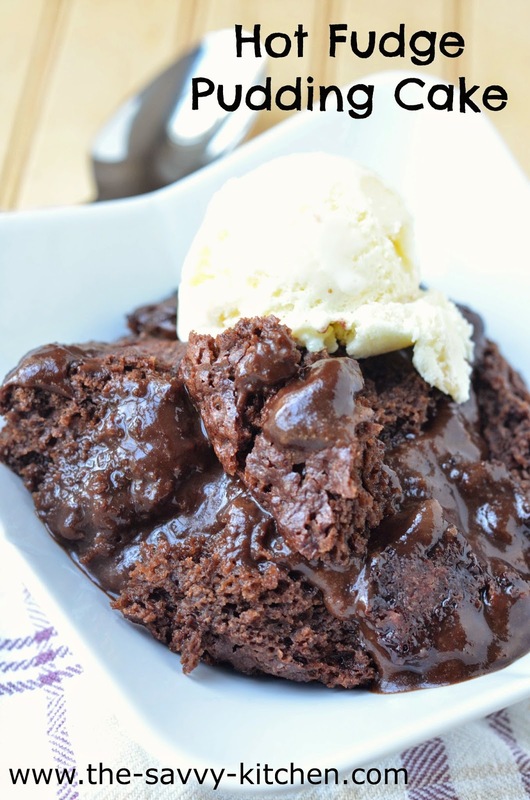 In a small bowl, stir together the remaining 1/2 cup granulated sugar, brown sugar, remaining 1/4 cup cocoa and mix well. Sprinkle this mixture evenly over the batter in your dish or pan. Pour the hot water over the top – but do not stir! Bake 35-40 minutes if using a 2-quart dish (or 30-35 minutes if using the 9x9 pan) – or until the center is almost set. Remove your dish from the oven and allow it to stand for 15 minutes.